Touch Entry Devices - Orion Systems Inc. 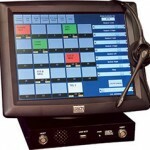 The Orion Systems Touch Entry Device interconnects Console Operators with radios, telephones, and other operators. The Touch Entry Device connects to an Orion Voice Conference Switch (VCS) via optional T1, E1, VoIP, or Fiber Optic interfaces. Interface options are defined at time of order. The Touch Entry Device is comprised of a electronics chassis and a color touch screen monitor. The electronics chassis is 1 rack unit high and includes 2 front facing headset jacks, 2 additional rear facing headset jacks. Also included is an integrated front facing speaker, rear access external speaker interface, and a rear mounted footswitch connector. The electronics chassis and touch screen monitor can be either rack mounted or desk mounted. The 2 front facing headset interfaces can be set to operate as supervisor/trainee or equal capability. The Touch Entry Devices graphical user interface features include Per Circuit Volume, Patch, Audio Present, Headset Volume selections, Multi-Monitor, Multi-Talk (optional), and a Per Circuit Label. Mean Time to Repair (MTTR) < 0.5 hour.